Will new stars, producers & format save Nine’s AFL Footy Show? The program will be again be produced for Nine by Eddie McGuire’s JAM TV. Nine’s Footy Show returns on Wednesday, March 20, at 9pm with a new format and a new team. 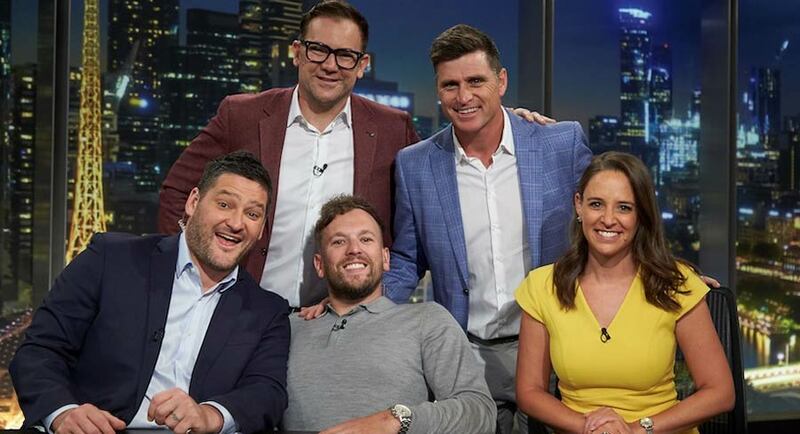 Nine has confirmed Hawthorn tragic and comedian Anthony “Lehmo” Lehmann, sports journalist and commentator Neroli Meadows from Fox Footy, former AFL superstar and radio host Brendan Fevola and Paralympian Dylan Alcott will head up the panel for Australia’s longest running live footy entertainment show in 2019. They will be joined by the Hawthorn premiership star and Brownlow Medallist Shane Crawford, whose new role will see him visiting the local clubs and community heartlands. The program will be again be produced for Nine by Eddie McGuire’s JAM TV. Executive Producers for Jam are McGuire’s former Triple breakfast EP Jay Mueller and another Triple M alumni Luke Tunnecliffe. Executive producer for Nine is Anthony Watt (formerly of Spicks & Specks). This week, 2018 breakout star, Collingwood’s Mason Cox, will be on the panel along with veteran Hawthorn player Shaun Burgoyne. NRL champion Billy Slater will also visit to chat about his new gig with St Kilda, where he is playing a pivotal role in their leadership and development programs. Essendon premiership player and three-time Coleman Medallist Matthew Lloyd will bring his extensive football knowledge as he previews all the Round One action. Entertainment will be provided by ARC – comprising Powderfinger’s Darren Middleton, Jet’s Mark Wilson, You Am I’s Davey Lane and Spiderbait’s Kram – who will perform for viewers ahead of their upcoming Abbey Road Tribute Tour. Melbourne football journalist, podcaster and Nine contributor Caroline Wilson mentioned last week the new Footy Show format could be borrowing elements from Graham Norton’s successful weekly TV talk show.